Bead, Swarovski® crystals, lime AB, 4mm Xilion bicone (5328). Sold per pkg of 48. Item Number: H20-6908CY Have a question about this item? Enjoy a citrusy treat from Swarovski in the crystal color of lime. The refreshing hue is light and airy, lending itself perfectly to spring and summer jewelry designs as well as bringing a bit of golden green to autumnal-inspired creations. 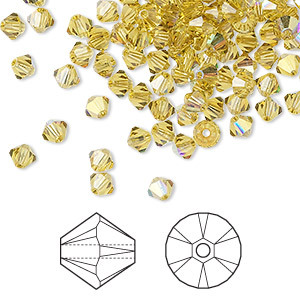 For a little sparkle that goes a long way ... design with Swarovski 4mm faceted bicones. Create glorious multi-strand necklaces with the dainty crystals or use as spacers to add a tiny flash to your designs. Bead, Swarovski® crystals, lime AB, 4mm Xilion bicone (5328). Sold per pkg of 144 (1 gross). Bead, Swarovski® crystals, lime AB, 4mm Xilion bicone (5328). Sold per pkg of 1,440 (10 gross).